In an anniversary that beautifully showcases the enduring greatness of man's progress in space, yesterday marked the 5,000th day of continuous human habitation aboard the one and only International Space Station. And today they'll get some fresh outfits! 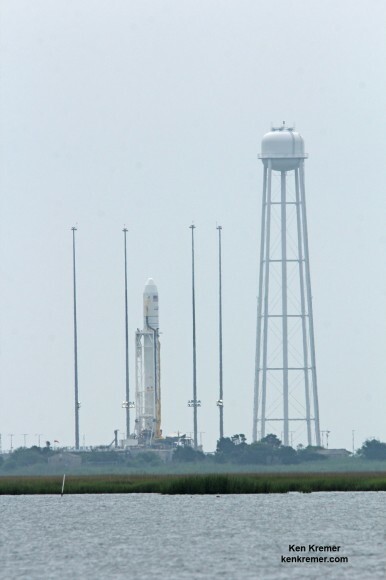 As ABC news reports, The Cygnus spacecraft, designed by Orbital Sciences (a private company contracted by NASA for the delivery), launched today from Wallops Island, Virginia. The launch had been delayed thanks to engine troubles, then poor weather conditions, but went up without a hitch. Some 3,000 pounds of cargo were aboard, including food, clothing, and science supplies, which will be transferred to the ISS after docking. The Cygnus will then be loaded up with garbage accrued from the ISS. The non-reusable spacecraft will be sent back to Earth to burn up in the atmosphere, like a futuristic trash incinerator. An interesting item on the delivery list is a shipment of antibacterial workout clothes that are supposed to be resistant to unpleasant odors, which allows for fewer changes of clothing (even after the two hours a day of exercise that is required to keep the micro-gravity dwellers fit.) Because when living in an enclosed place with six other people and no way to crack a window for air, smelling nice is important. Beautiful day for a blastoff!